Mackenzie @ think eat write read did this wonderful tag called 'Bookish Tag' back in May! I loved her answers but the set of questions looked familiar. Then I remember that Cait @ Paper Fury did a tag called 'I Dare You', with the same set of questions. So they both changed things up (Cait added more questions and Mackenize found a different tag name) but I've decided to follow Mackenzie's post. *wipes sweat off my forehead* So! 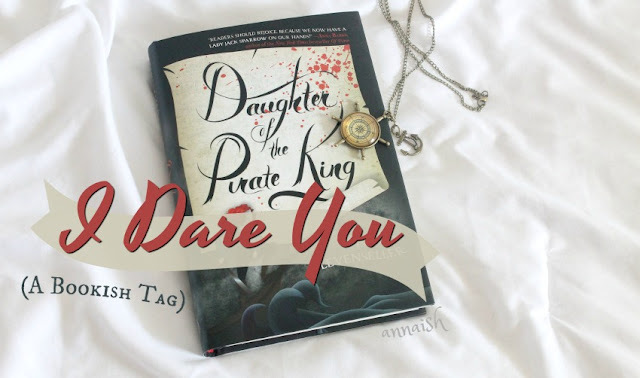 Haha - without further ado, here's my go at the I Dare You (A Bookish Tag). I actually found the original creator of this tag! It took like an hour bUT Lola @ bookfandom1001 started this set of questions. Here's her post! 📚 WHICH BOOK HAS BEEN ON YOUR SHELF THE LONGEST? 📚 WHAT IS YOUR CURRENT READ, YOUR LAST READ, AND THE BOOK YOU'LL BE READING NEXT? I'm currently reading The Hate U Give (FINALLY). It's already sO good. My last read was Always & Forever, Lara Jean, cute as heck! And I hope to follow my June TBR - I have trouble with TBR's but I have a good feeling about this one. So maybe I'll start my Aristotle and Dante Discover the Secrets of the Universe reread? Or maybe continue The Trials of Apollo - The Dark Prophecy? maYBE I'LL TACKLE LES MISÉRABLES?? Not sure yet. 📚 WHAT BOOK DID EVERYONE LIKE BUT YOU HATED? I will never understand how people enjoyed Finding Audrey. That book was a hot mess! Before I start ranting, the topic that bothered me the most was how the mental illness was portrayed. It was a joke! It was never taken seriously! I wanted to pull my hair out! I mean, I get (somehow) that Audrey's illness was the humor but seriously? I didn't find that the most "refreshing" way to discuss mental illnesses. It was uncomfortable and quite sad. Oops I started ranting. Let's just say this - I'll never read another book by that author (sorry not sorry). 📚 WHAT BOOK DO YOU KEEP TELLING YOURSELF YOU'LL READ BUT YOU PROBABLY WON'T? Me: Hey Mom - I'm having trouble picking out a book, can you just pick one out for me? Me: Ohh I've heard of this one! It's about magic and stuff. It's gotten good reviews ... I think on Goodreads. My Mom: Wow. I just thought it was really pretty. Me: Haha that's ok, thank you. 📚 WHAT BOOKS ARE YOU SAVING FOR RETIREMENT? Uhh nothing really. Retirement isn't even on my mind right now haha. I'll probably read the Game of Thrones series, in New Zealand, in my Hobbit hole. Retirement goals am I right? 📚 LAST PAGE: READ IT FIRST OR WAIT UNTIL THE END? Until the end! What kind of monster do you think I am?! Actually that's a lie I used to be that kind of monster. Younger me read the last pages of Allegiant and The Fault in Our Stars. I know, not my best reading decision! Although I already knew what was going to happen (THANKS INTERNET) but seeing everything in print still hurt ... a lot. 📚 ACKNOWLEDGMENTS: WASTE OF PAPER AND INK, OR INTERESTING ASIDE? Lowkey surprised this is even a question. Acknowledgements aren't a waste of paper and ink. (???) I find acknowledgements very interesting because a) i'm curious hehe b) this isn't my book?? an author poured their heart into their book?? and they have people to thank?? and c) sometimes an author will add a "thanks!" to their readers/bloggers/reviewers, which makes me really happy! because i'm a reader/blogger/reviewer person!! yay!!! 📚 WHICH BOOK CHARACTER WOULD YOU SWITCH PLACES WITH? Oh my gosh let me think. I actually have a few in mind (I've been reading a lot of contemporaries so) but Blue Sargent (!!!) from The Raven Boys would be amazing to switch. becAUSE THE RAVEN BOYS MY FAVES. AND NOAH AND SEEING HENRIETTA WOULD BE ASDFGHJKL I LOVE THE RAVEN CYCLE. 📚 NAME AN INTERESTING BOOK THAT YOU ACQUIRED IN AN INTERESTING WAY. Ehhh? I'll usually loan books from libraries or get books as gifts. I don't acquire my books in any interesting form. Waiiiiit, except, I guess? Free Little Libraries? They're pretty common in my area (I have NO idea for the rest of the world) but they're super cool. You basically donate your own book to a Free Little Library and then you're allowed to take one other, donated book. Again, they're super cool and I love them! Here's the website if anyone is interested. 📚 HAVE YOU EVER GIVEN A BOOK AWAY FOR A SPECIAL REASON TO A SPECIAL PERSON? I've only donated books (which isn't that special to me, it's just a thing I do) but I've offERED people to borrow my books (because I'm lonely and want to people to read). But my family and friends just say: "Oh no! Don't worry Anna, I can get my own copy. Thanks tho!" UHHH I MEAN. Thank YOU for not destroying my book but?! Are you still going to read it?! Please?! 📚 WHICH BOOK HAS BEEN WITH YOU MOST PLACES? 📚 ANY REQUIRED READING IN HIGH SCHOOL THAT WASN'T SO BAD? I'm still in high school and homeschooled sooooo. *awkward silence* I did like all my required reading in elementary/middle school so let's just assume I would enjoy my required reading in public high school. 📚 USED OR BRAND NEW? I prefer my hardcovers brand new and paperbacks used. I (reaLLY) dislike used hardcovers because they'll have old fingerprints (OLD FOOD STAINS TOO UGH) or notes/names and spine will bE CRACKED. *cues me, screaming* So new hardcovers please. Paperbacks can go either way to be honest. I just prefer used paperbacks more because the spine wiLL be cracked and those are easier to use for photos. I'm weird I know. 📚 HAVE YOU EVER READ A DAN BROWN BOOK? No. I've never heard of him until this tag. *searches him on google* Oh I do recognize his book called The Da Vinci Code. I think one of my grandparents owned a copy. But I won't be reading his books soon haha. 📚 HAVE YOU EVER SEEN A MOVIE YOU LIKED MORE THAN THE BOOK? I always use this adaptation as an example because it's literally the only one I support (half the time I guess). Yikes. Anyhoo! I liked the Insurgent movie adaptation better then the book because I liked the changes they made. See, I didn't like the book in the first place. The book had no action but the movie did. I was more entertained with the movie. But that's about it ha. 📚 HAVE YOU EVER READ A BOOK THAT MADE YOU HUNGRY (COOKBOOKS INCLUDED)? 📚 WHO IS THE PERSON WHOSE BOOK ADVICE YOU'LL ALWAYS TAKE? My blogger besties for sure! (Check out my sidebar, scroll to 'my favorite reads' to check them out) We all have prettyyy similar reading tastes and they all are honest and open about what they read. I just love them. 📚 IS THERE A BOOK OUT OF YOUR COMFORT ZONE (E.G. OUTSIDE YOUR USUAL READING GENRE) THAT YOU ENDED UP LOVING? I've always been hesitant about the historical fiction genre (one word: boring) but, you know, the books I've read (sO far) have been great! I enjoyed them and wasn't bored to death. Here's a few: Dreamland Burning, The Book Thief and A Tyranny of Petticoat. Hey bookaholics! I tag any bookaholic to participate in this tag. <3 Anyhoo, has anyone read 'The Girl at Midnight'?? (I'm curious now hehe) Have you seen a Free Little Library? Acknowledgements: a waste or interesting? Let's chat about it! Oh my gosh haha - I can relate. I had lots of fun! Thank you, Mackenzie. Thanks!! Me too, I'm always curious hehe. Of course. <3 YOU SHOULD OMG. What a plot twist. YESSS LES MIS. It can be dense at parts, but the prose is incredibly beautiful and insightful when you slow down to appreciate it. I got through it by finishing 100 pages a day, and it was a wonderful read <3 I hope you enjoy it, whenever you get to it! Lol, we'll be hobbit hole neighbors! I LOVE LITTLE FREE LIBRARIES. There's one right by my house and two others less than a mile away. I brought Carry On on a road trip to Omaha, when some of my friends and I went to an Ingrid Michaelson concert! I think Les Mis has been with me the most places, though. I don't read a lot of historical fiction, but I think the fact that I'm picky about it ensures that I usually like the ones I read. Ones I've enjoyed include The Song of Achilles by Madeline Miller (I think you'd really like this one, if you haven't read it already), Ruler of the Night by David Morrell, and The Blackthorn Key by Kevin Sands (FAVE). Wowww I'm so excited to dive into Les Mis! Thank you, Ellie. That's nice! But how do you travel with Les Mis? That book is massive!? Awesome answers! I also did this tag and I had a lot of fun with it. Thanks! I'll have to check out your post then, Nabila. THE HATE U GIVE IS SO AMAZING OH MY GOSH I'M SO GLAD YOU'RE READING IT ANNA! It absolutely blew me away because that book is SO GODDAMN AMAZING! I FINISHED THUG LAST NIGHT AND IT WAS AMAZINGGG! Ooooh, Anna! For historical fiction I totally recommend All the Light We Cannot See. It is one of the best books ever and so beautifully written. But anyways, I totally understand about Finding Audrey. I hate when books misrepresent mental illness and I have heard some problematic things about that one so I will definitely never read it. And I would so switch places with Blue. I love The Raven Boys with all of my heart and I still cannot believe it is over :( Awesome post, Anna! I don't always like reading tags but I always love yours. All the Light We Cannot See sounds familiar? Hmm I'll have to check it out, thanks for the recommendation! Glad you agree with me on Finding Audrey. That book was so awful. Me toooo I miss The Raven Boys so much :,) my heart. Thank you so much, Erin!